Elections are very complex projects to manage. They usually take place over large territories, involve thousands of candidates in hundreds of jurisdictions competing simultaneously, require millions of election instruments to be under strict supervision while they are distributed across the national territory, and they require the concerted effort of thousands of poll workers and contractors working under very tight schedules. Technology can play a crucial role in the transparent, legitimate and secure execution of all these processes, by guaranteeing that every stage of the election is carried out effectively and efficiently. This is why countries worldwide have come to realize that technology is crucial to the efficient administration of elections. To help countries understand the options available, and provide a frame of reference, Smartmatic developed the Electoral Automation Maturity Model. 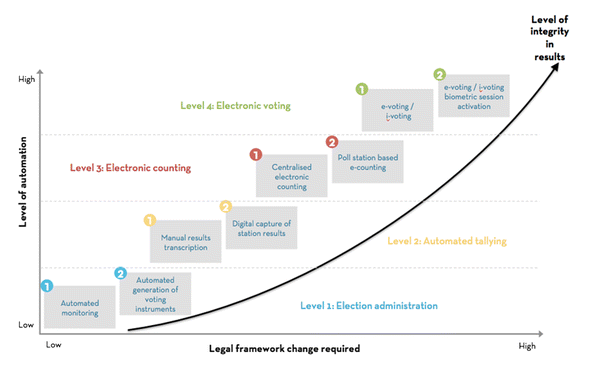 According to the model, there are eight levels of automation which range from level 1, the bare minimum where technology is only used to monitor the manual processes being carried to run the election, to level 8, which combines electronic voting and biometrics to authenticate voters and activate voting sessions. Currently, countries are at different levels of automation. Venezuela stands today as the only country automating its elections form end-to-end with a fully verifiable solution. Every single voter is authenticated via biometrics at the polling station and each vote is processed electronically from the moment it is cast until it shows on the Internet when results are published. Along with Venezuela in level 4 are India and Brazil. They also use electronic voting machines for every vote cast but biometric authentication is not available for all voters. The Philippines and Mongolia are examples of level 3, as they use optical scanners in precincts to process the paper ballots filled by voters. Argentina and Mexico are two examples of Level 2. They use technology to digitize count reports and streamline the processing of the votes. Although the majority of the countries are yet to fully embrace technology, the needs are enormous. The election maturity model is a good way to signal the path.